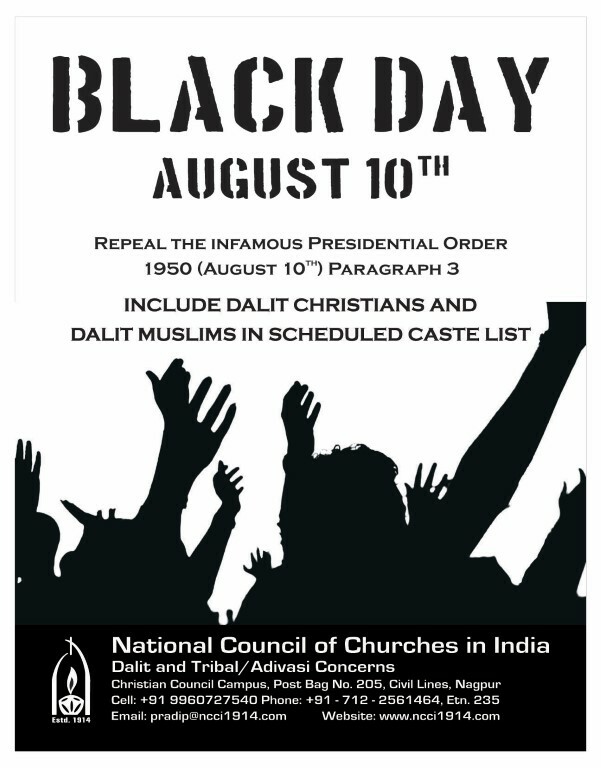 National Council of Churches in India-Dalit and Tribal/Adivasi Concerns appeals to the Churches and Christian organisations to proactively participate in observing ‘Black Day’ on 10th August 2017 to raise our protest regarding the continual negligence of the government to the cry for the rights of Dalit Christians and Dalit Muslims in the country. 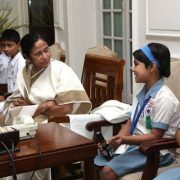 The infamous Presidential (Scheduled Caste) Order 1950 was signed on 10th August 1950 by the then President of India which says “No person who professes a religion other than Hinduism shall be deemed to be a member of the scheduled caste” which was later amended to include Sikhs (1956) and Buddhists (1990) in the Scheduled Caste net. But this law, as we are all aware of, keeps the Dalit Muslims and Dalit Christians from the Scheduled Castes list. 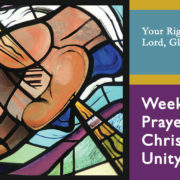 We request you to kindly observe ‘Black Day’ by organising protest meetings/ rallies/ demonstrations/ hunger fasts/ submitting memoranda/ candle vigils/ special prayers and other appropriate programmes in your church/institution to express our solidarity with the suffering Christians and Muslims of Scheduled caste origin. 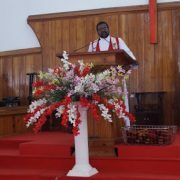 The Churches and Christian organisations of NCCI are also requested to wear black badges on 10th August 2017 and display the posters, which are being sent, on your notice boards. We would appreciate if you send couple of photos and a brief report of the observance to the undersigned. 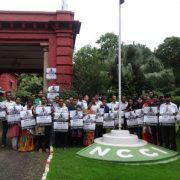 https://ncci1914.com/wp-content/uploads/2017/06/Black-day-Poster-2017-Final-Medium.jpg 768 601 Dalit & Tribal/ Adivasi Concerns http://ncci1914.com/wp-content/uploads/2018/05/NCCILOGO105-300x72.png Dalit & Tribal/ Adivasi Concerns2017-06-08 19:31:592017-06-09 16:37:32Appeal to observe AUGUST 10th as "Black Day"